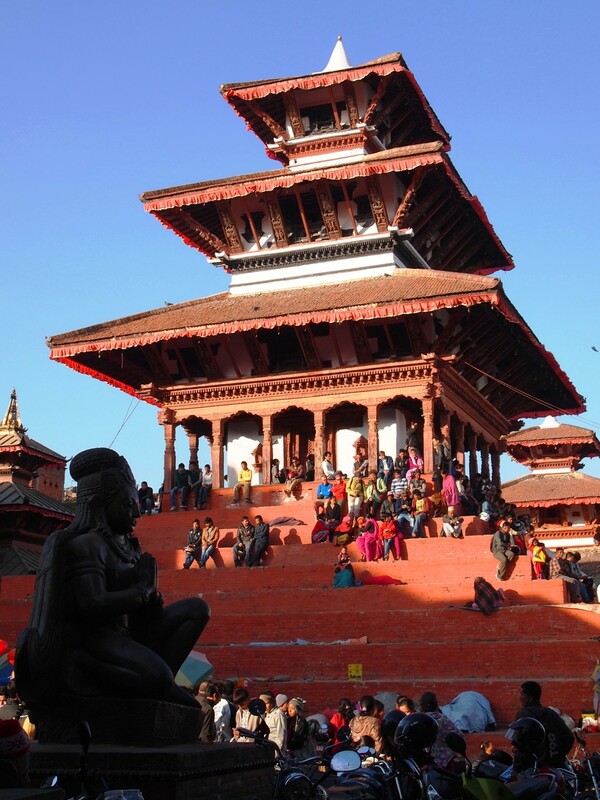 It is also famously called as Basantapur Durbar Square and Hanuman Dhoka Durbar Square. Located in front of Kathmandu’s royal palace, this spectacular Durbar Square reflects the artistry that prevailed in the past. Kathmandu Durbar Square houses palaces and ancient temples that belong to the periods between 12th and 18th centuries. The cultural spirit of Nepal centers in Kathmandu Valley and hence Kathmandu Durbar Square gains more prominence. It consists of two divisions, which are referred to as outer complex and inner complex. The outer complex has famous temples namely Taleju Temple, Jagannath Temple, Shiv-Parvati Temple, Big Bell and Kumari Bahal. The inner complex has old palace, courtyards, Basantapur Durbar, Hanuman Dhoka and other structures. Taleju Temple: The first three-tired temple of the land, Taleju Temple, is considered an important religious site by followers of Hinduism and Jainism. Legend goes that Goddess Taleju had appeared before the king in the form of bee to advice that the temple be built resembling the design of yantra. Jagannath Temple: Jagannath Temple was initially dedicated to Lord Vishnu and later it was re-dedicated to Lord Jagannath. The temple is a fine example of architectural splendor of the past. Exquisite carvings on the doors and windows are an inspiration to any artistic mind. Shiv-Parvati Temple: It is one of the famous temples in Kathmandu Square Durbar. Dedicated to Shiva and Parvati, the temple is believed to be reconstructed later. Kumari Bahal: Kumari Bahal is the abode of Living Goddess. Built in the year 1757, it resembles a monastery. A girl chosen to be living goddess of the town lives in the place until she reaches puberty after which she returns to her normal life. Bhandarkal: Bhandarkal is yet another attraction in Kathmandu Durbar Square. It is a botanical garden established by King Pratap Mall during 17th century. The garden earns its name after a palace that houses the statue of Jalashayana Narayan, the Sleeping Vishnu. With wide range of fauna, Bhandarkal is haven for nature lovers.